Whether you took your Shahadah (Declaration of Faith) two days ago or two decades ago, join our New Muslims monthly book-club gathering to build community and support with others new to the faith. 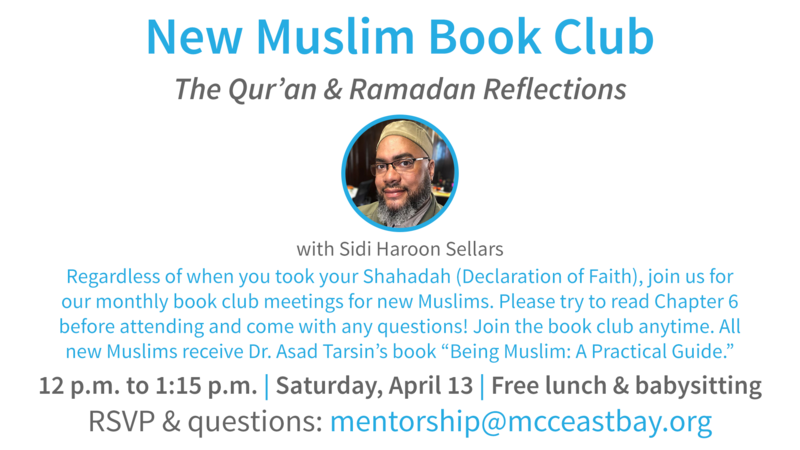 At each meeting, we discuss a Chapter from Dr. Asad Tarsin’s book “Being Muslim: A Practical Guide.” Please read the chapter before the book club meeting. At this monthly meeting, we will discuss Chapter 6 about the Qur’an with Sidi Haroon Sellars. There will be plenty of time for questions and discussion, inshaAllah! Every book club member receives a free copy of this valuable book. Please just arrive to receive the book from MCC New Muslim Group Coordinator Edlyn Sammanasu at mentorship@mcceastbay.org. Please let Sr. Edlyn know if you need babysitting. 12 p.m. to 1:15 p.m. | Saturday. April 13 | Lunch afterward Zuhr at 1:30 p.m.
No registration needed. Questions? New Muslim Coordinator Sister Edlyn Sammanasu at mentorship@mcceastbay.org. If you are a new Muslim in the East Bay and you are not receiving our new Muslim updates, please send us an email at mentorship@mcceastbay.org. Dr. Asad Tarsin has been designing Islamic educational programs and teaching the basics of Islam for more than a decade. After completing his bachelor’s degree in Islamic studies at the University of Michigan in Ann Arbor, he continued his study of Islamic theology, sacred law, philosophy and spirituality with some of the country’s most prominent Muslim scholars. He has served as the curriculum director for the Deen Intensive Foundation for the last ten years and has a particular interest in creating sustainable models of education for new and returning Muslims. He lectures and teaches courses on Islam across the country. In 2015, he released his first published work, “Being Muslim: A Practical Guide,” a primer on practicing the faith. He is an emergency physician by training and lives in California with his wife and three children.